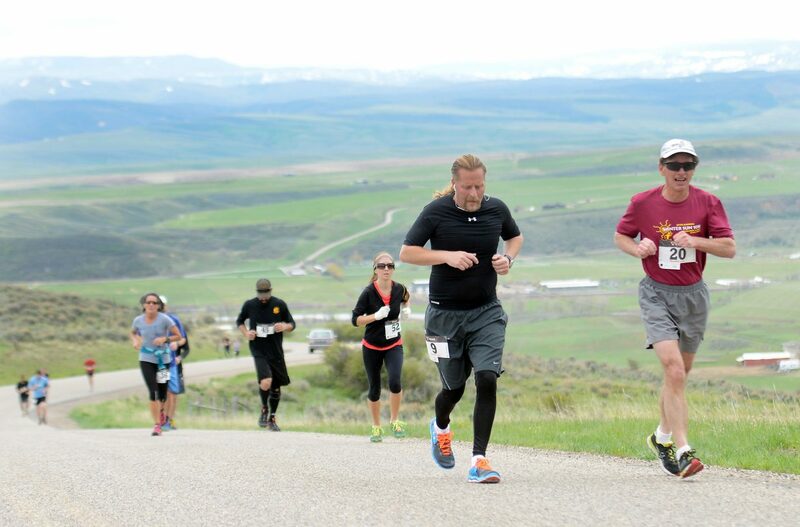 Jonah Drescher, left, and James Morton lead a pack of runners up the Cog Road outside Hayden on Saturday. The annual race drew more than 100 runners. Find the full Hayden Cog Run race results here. Hayden — The Hayden Cog Run is like two races in one, Harry Niedl explained. There’s the race out — a 4-plus mile journey out along Routt County Road 76 to the top of the Cog Road to a turnaround that towers over the town of Hayden and the vast, green valley below. That’s grueling, with the kind of sustained, steep uphill that few road running races in the region offer. Then there’s the race back down that road, those views hanging in front as even the best runners struggle to keep their feet moving faster than their gravity-assisted body. Niedl won both of those races Saturday, the reigning Steamboat Springs Running Series season-long men’s champ kicking off the new year with a commanding performance in Hayden. “It’s tough. You have to know the course,” Niedl said. Hayden, too, emerged a champion Saturday, drawing one of the biggest crowds in recent Cog history for the long run — 8.4 miles on paper, but, according to racers who were keeping track Saturday, closer to 9 — and a 5-kilometer run on flatter terrain around town. The day was livened by the Craig Hotshot forest firefighters, who tend to have that effect whenever conditions allow them to make the short trip over for the event. This year, they brought about 20 athletes and they announced their presence throughout the day with loud cheers, plenty of whooping and hollering and, for many, gutsy sprints to the finish. Niedl won the men’s Cog run in 57:48. Brad Reidhead wasn’t far back at 59:14 and Eddie Rogers was third in 1:02:20. Heather Gollnick ran away with the women’s race, finishing in 1:06:01. Andrea Wilhelm was second at 1:07:42 and Tonya Ansel was third in 1:11:15. Cara Piske won the women’s 5K race, in 25:00. Carrie Thompson was second at 26:22 and Gretchen Burkholder third at 26:52. Paul Hughes won on the boy’s side in 21:04. Tyler Terranova was second at 21:12 and Evan Bariber was third in 21:59.